One of the disadvantages of machine quilting on a DSM is that there is more 'poofiness' for lack of a better word, while the work is in process. But when completed, and blocked, it will be fine. BTW, my SIL LOVED her small "Mother Earth" quilt - it arrived safely in Wisconsin. Great design and executed well! You do a wonderful job machine quilting. It looks like a longarmer did it. Great quilting. Can you do a bit of ditch quilting on each side of the ribbon? love the way the leaf pokes into that area close to the ribbon. The quilting is unique and perfect for the space. Your work is always great. O like that you added the second line of stitching on the border. Especially since it is variegated thread. you are a true artist with the quilting! I really like how it looks. If you hadn't said you added the second line I would have thought that was the way it was meant to be the first time. it looks great. 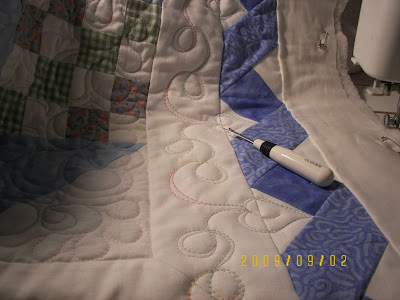 I am amazed that you can do such wonderful quilting on your DSM. It's beautiful. Your quilting is wonderful!! I love the border treatment, perfect! Very clever to add the second line around the border quilting. It looks great! I love the way the leaf falls into the gap in the ribbon. Your border quilting is beautiful, and so imaginative - love the leaf that settles down between the ribbon twists. The quilting in the center is also wonderful. So talented! That is a very creative quilting design - I love it!!! The inside quilting is great too. I need to review my Patsy Thompson DVD some more. Maybe someday I can "get it" too! You are getting so good at the FMQing that I think you should change your blog title to Elaine Adair Quilts. Great looking pattern. Love that border quilting! The second line gives such a neat effect! Oh your quilting is FANTASTIC!